This research examines the relationship between corporate social responsibility (CSR) and company stock valuation across three regions of the world. After a brief introduction, the article gives an overview of the evolving definition of CSR as well as a discussion of the ways in which this construct has been operationalized. Presentation of the potential impact of corporate social performance on firm financial performance follows, including investor characteristics, the rationale behind their choices, and their influence on the marketplace for securities worldwide. The unique method used to select socially responsible investments is then provided that also includes a description of the quantitative techniques employed in the analyses. 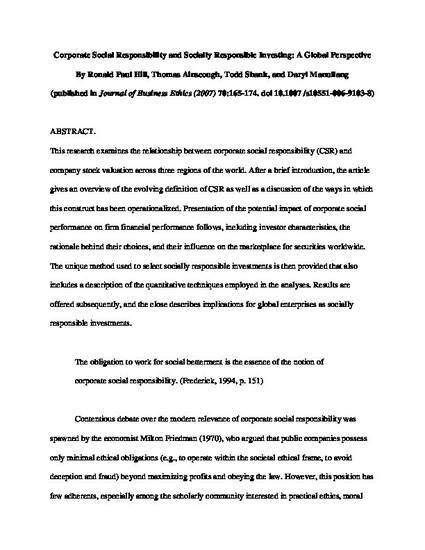 Results are offered subsequently, and the close describes implications for global enterprises as socially responsible investments.